SWMD-I-8TX is a ruggedized Ethernet switch in a DIN rail mounting format. 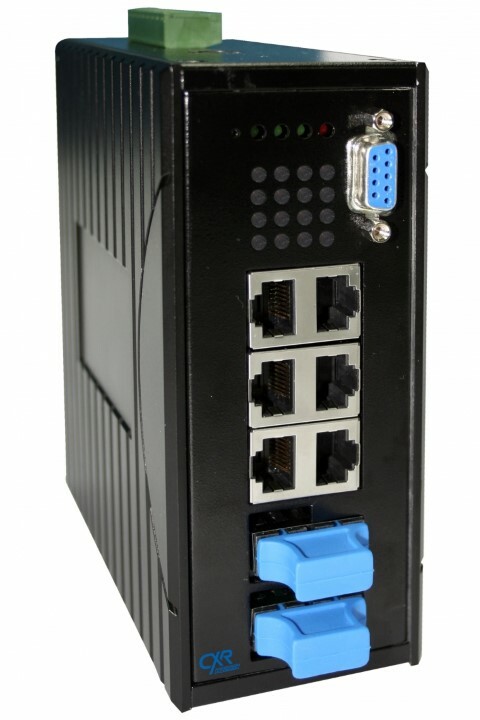 It delivers 8 Fast Ethernet ports with options for 2 or 4 optical interfaces for SFP modules to design a long reach optical network immune against electromagnetic interferences. Its size, dual 12-48 Vdc power supply input, industrial design and its rich feature set, make it a polyvalent switch to serve all type of industry requirements. The range of product is qualified for extended operating temperature range from -40 to +75 °C, and for ground railway installations. SWMD-I-8TX embeds a full set of protocols to implement an Ethernet network and manage application and user traffics. Critical trunks may be redundant with STP/RSTP/MSTP, and access security is based on authentication and packet filtering. Traffics are isolated into 802.1Q VLAN's and VLAN management is made easy with GVRP protocol. IGMP-Snooping enables video streaming applications. SWMD-I-8TX is controlled through a CLI or a user friendly web interface. It is a DIN rail box with a dual 12-48 Vdc power input. SWMD-I-8TX is an industry grade design with a fan-less temperature range. It brings reliability and performance required by the most stringent industry requirements.